PSKOOK Bungee Dog Leash Zero Shock Tactical Control Training Lead Shock Absorbing with Handle Heavy Duty Adjustable Nylon Rope. Tactical Dog Leash Material - Aeronautical aluminum mountaineering buckle (can stand 5KN), 1000D Nylon series, Elastic Bungee Band. Bungee Leash with Adjustable Length - 41 to 54 inch, enough stretch, Zero Shock Extension, quick release, can reduces dogs' risk of injury and increases comfort, best for large dogs sprint buffer, doesn't choke, lets the dog explore. 2 Control Handles - 1 Traffic Handle keep your dog closer to you in traffic, obedience class, panic snap can control your dog easily. 1 Hand Grip for casual dog walks. Shock Absorbing Dog Control & Training Leash, durable for medium & heavy duty dogs, still good for small puppy. Perfect for Dogs / Pets outdoor Training, Mountain Climbing, Hiking, Walking and Jogging . You can refer to the relevant instructions and video for more details and more funny and innovative products. Welcome your reasonable suggestions for more fun next time. You can search PSKOOK to watch related video and instructions, you will find more funny and innovative products from us, like Paracord Bracelet/Winder/Jigs/Needles, Wood drilling fire, Spork, Gun Sock, etc. If you have any questions about this product by PSKOOK, contact us by completing and submitting the form below. If you are looking for a specif part number, please include it with your message. Highland Farms Select Premier 6ft Leather Dog Training Leash. 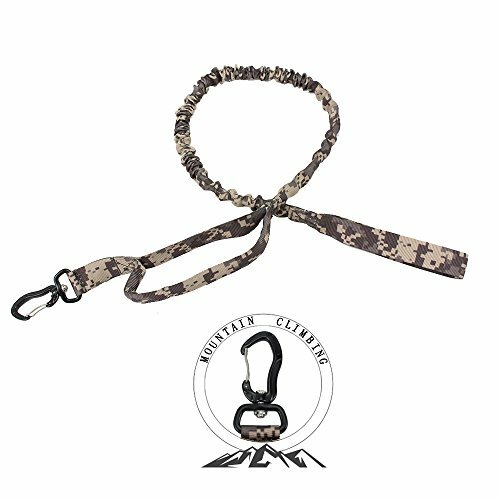 Made from Leather and is a Great Option for Hunting Dogs or General Obedience in the Backyard.